In the last few posts we’ve covered a range of issues: varying levels of infrastructure; the day-to-day challenges of getting things done; the importance of working through the consortia that countries are striving to develop. We deliberately started with these issues because they’re the all-too-important context that can get lost in conversations that begin with price. But of course price matters, and it’s one of the biggest concerns for INASP’s partners, particularly as some begin to take on the negotiating role that INASP has played for many years. Our final two principles both tackle the finances so we’re grouping them together in this post. As we discussed in Principle 1, research and higher education are growing in many of our partner countries. Governments are increasing budgets, and there are some sizeable investments from donors. But consider the decades of underfunding that many countries suffered and you can see that much of this money is needed simply to rehabilitate or expand campuses, provide the IT infrastructure, or train staff. In Kenya, for example, enrolments to public universities have risen seven times faster than funding. And, as Trevor Namondwe of the Malawi consortium notes, “although there is increased intake of students in universities, it does not directly translate to more income generation by institutions because as the institutions grow, challenges follow suit”. Like water flowing through a long pipe, it also takes time for new funding to reach universities, increase library budgets (if it does at all – libraries are rarely at the head of the queue! ), and in turn to grow the consortium’s funding pot. (It’s worth emphasising that when we say consortia, we include other national purchasing arrangements – sometimes under a government agency, or a network of universities). University budgets are typically negotiated and agreed far in advance of when expenditure is actually committed – as we heard from Maria Eugenia (Principle 3) this can sometimes be eight months in advance in Central America – which means it’s unlikely that consortia can accommodate price increases unless they’re discussed in plenty of time. So when you’re approaching consortia – or when consortia indicate that they’re keen to talk directly – think about pricing as a longer-term goal. We recognize that working directly means publishers are likely to spend more time managing accounts. This brings new costs so prices may need to gradually increase as a result: negotiating prices with each consortium, agreeing licences, invoicing and providing supporting documentation, handling payments and dealing with queries. But consortia budgets (and those of their member institutions) are unlikely to have increased since last year – and they’re unlikely to increase much next year, or in the next few years. A small percentage increase in a dollar or sterling price can be much bigger when translated into local currencies in which budgets are set. In fact, with unstable currencies budgets may even have declined in real terms. As one of our partners explains, they need “flexible pricing that offers customers real options”. Consortia see a real value in developing longer-term relationships, and pricing is an important part of this. Consortia must strike a careful balance. There are more and more titles and resources that researchers want – and publishers want to sell them! However, there is also limited funding to buy everything that researchers need. Consortia need to make good decisions about what to buy, and this means sufficient time and information to do so. With fixed budgets, accommodating a rising price for one package inevitably means cutting something else. Mergers also mean that a publisher may be offering more content in a package each year – and the price of the package will increase accordingly – but it won’t necessarily be additional material that a consortium actually needs. Patrick Mapulanga of the Malawi Library and Information Consortium sums it up neatly: “Publishers are in business and African libraries are in a fix as there is no indication that e-resources are likely to become less expensive”. There are tough decisions we all have to make when budgets are limited – but the impact of rising prices and the resulting cuts to content on an emerging research cluster, or a new university, could be relatively significant. 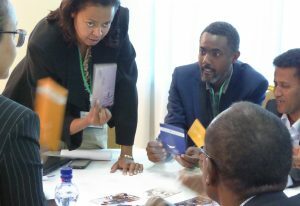 Our partner consortia are working hard to build a more sustainable foundation for research in their countries, and to do this they need to be able to serve their researchers well. Being forced to make deep cuts to collections weakens their efforts to engage faculty and show how they can and must be part of efforts to grow the research base. As our Malawian colleagues explained in our first post, the size of a consortium isn’t indicative of the number of active users, so as a consortium increases in size year by year, it doesn’t mean it’s becoming a larger consumer at the same rate. Geoffrey Salanje tells us that a lot of members are members in name only; in fact some may not have contributed their share of the subscription costs. So what is an affordable, incremental and predictable increase? Well, as you’d expect, it depends on the country. But increases of anything more than 2% each year are likely to cause problems for consortia. If there is an expectation that the price increases by any set figure or percentage over a period, make this clear from the start so that consortia can prepare. It’s tempting to think that if a consortium can’t meet the price, tapping the funding at source – by going direct to government or university leadership – is a better option. But (unless this is how a country has chosen to provide e-resources) all this does is create more hassle for librarians and consortia leaders (most of whom are working hard to support national access on top of their institutional day jobs). It will only damage relationships in the long run. But there’s plenty of good practice here that we should acknowledge. Some publishers that INASP has worked with over the years have been able to freeze prices for several years or offer 18 months’ notice when a price increase is expected. In such instances we tend to see fewer cancellations. We hope you’ve found this series helpful – and that it’s prompted some useful conversations. You can read the earlier blogs here. We’ll be taking these further at Tuesday’s Publishers for Development conference, so we hope to see you there. Join the conversation by following us on Twitter, and using the hashtag #inaspPrinciples. More information can be found on the Publishers for Development website.